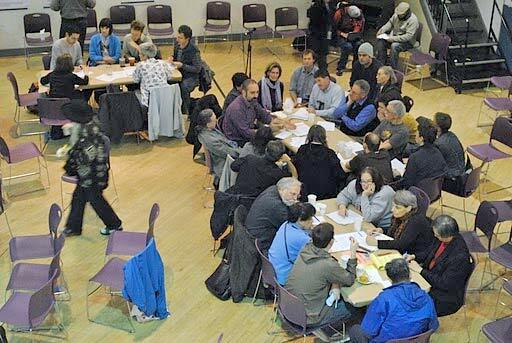 SAVE MUNI Meeting – Monday March 18 at the Northern Police Station (Turk & Fillmore) Starts promptly at 5:30 Special Guest: Candace Sue, Director of Marketing and Communications for the MTA. Candace will take ytour questions about complaints to MTA and about the outreach process. Save Muni will also discuss the MTAs Light Rail Vehicle modifications. On December 11, SaveMuni members were treated to a tour of the County Transportation Authority’s control center at 1455 Market Street. The center is currently being upgraded to fully monitor and control the entire fleet of bus and streetcar vehicles. Eventually there will be redundant control facilities at Turk Street (OCC) and West Portal so that the system can be run from any of the three locations in an emergency. Recently a fire alarm required the evacuation of the TA facility; the OCC site was able to take over and manage everything on its own. Muni Operations Manager Ron Forrest answered our questions in the “War Room” before showing us around the facility. Ron comes to us fresh from having run the Atlanta transit operation, which has some pretty incredible on-time statistics. The War Room is equipped with about a dozen cabled laptops and is is a gathering place for MTA and other city officials when there is an emergency or a civic event that threatens to stress the system. There are many things in the works right now, but perhaps the most critical is upgrading the communications system so that multiple controllers can be talking to multiple drivers at a time. Incredibly, with the current system, only one controller may be speaking with a driver at a given time. The new radio system should be operational on all vehicles by April. There are cameras on all vehicles and along heavily used (downtown) routes. Of course, Muni riders will tell you that the heavily used routes are not generally where they have problems. In-vehicle cameras do not currently provide live feeds to the controllers. BART District 8 Candidates Night at Save Muni’s Monday, October 15 meeting. The Candidates Night is scheduled from 6:30 to 7:30 at the Northern Police Station (Turk & Fillmore).